Vital repairs are being made to the roof of the Victoria Theatre in Halifax. The theatre was built in the late 19th Century, with the foundation stone laid in 1899. As is common in buildings of this age, some areas of the building are now in poor condition, the roof being the worst of these areas. 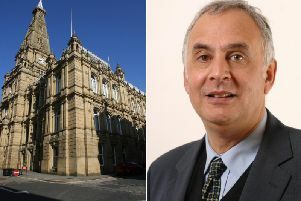 Calderdale Council’s Cabinet Member for Regeneration and Economic Development, Councillor Barry Collins, said: “The Victoria Theatre is a much cherished building in Halifax Town Centre, but as with many Victorian buildings, it’s costly and complex to maintain. Repairs are being made in three stages. Phase one was completed in 2016 with repairs to the roof above the auditorium. The next section of work is Phase two and focusses on the area above the theatre offices. Work in this phase will include re-slating to make the roof watertight, insulation improvements and drainage works to the areas of flat roofs. The next phase will then finish off all other areas of the roof. Once the roof work is complete and the building watertight, attention can then turn to the interior of the building and improving the décor, visitor flow, services and accessibility. As well as the significant investment in future-proofing the building, the theatre also has ambitious plans to complement this work. The Friends of the Victoria Theatre group aims to bring people together to share their passion, skills and experience to help increase the profile of the theatre and raise funds for improvements to heritage and restoration, as well as the theatre’s programme and marketing. Calderdale Council’s Cabinet Member for Neighbourhoods and Communities, Coun Susan Press, said: “We’re passionate about the Victoria Theatre, as are many other people in Calderdale. “To ensure the quality of the building matches the quality of the entertainment on offer, it’s important that we invest in the theatre’s future.